Summary (from Goodreads): Dara and Nick used to be inseparable, but that was before the accident that left Dara's beautiful face scarred and the two sisters totally estranged. When Dara vanishes on her birthday, Nick thinks Dara is just playing around. But another girl, nine-year-old Madeline Snow, has vanished, too, and Nick becomes increasingly convinced that the two disappearances are linked. Now Nick has to find her sister, before it's too late. My Summary: Nick and Dara are the closest sisters you'll ever meet. They share everything: secrets, clothes, friends... and much to Nick's horror, John Parker. But that's okay, because Nick loves Dara and wants her to be happy - even if that means her sister and her best friend become an item. She'll deal, because when you love your sister as much as Nick does, that's just what you do. After the accident, Nick and Dara barely speak. Dara avoids Nick like the plague, keeping to her room and the bad side of town. With the two sisters living under one roof and doing everything possible not to speak, it's hard not to wonder what exactly happened the night of the accident. If only Nick could remember. She knows that the only way to repair their relationship is to figure out what happened that night. But as pieces of that night start to come back to her, Nick starts losing pieces of herself. What is it that caused the change in Dara? And why does it feel like Nick will have to risk everything to bring back what matters most: her sister? My Thoughts: This book was a wild ride. Things started off slowly but progressed so quickly that I found myself unable to put it down for more than a few moments at a time. Oliver's writing had me hooked from the very first page, sucked into Nick and Dara's world like I'd been there all along. The pacing was perfect, and the atmosphere was so rich and dark that I found myself creeped out before anything had even begun to happen. Oliver is a master world-builder, bringing together so many little things so that Nick and Dara seemed so incredibly real. I had to blink a few times every time I looked up from the book just to remind myself that I wasn't living in Nick and Dara's world. Anyone who has a really strong bond with a sibling will recognize Nick and Dara's love for one another. It was imperfect and not always healthy, but it was unconditional and strong. There is some romance in the novel, but I think that at its core, this is a story about the intensity of the love between two sisters and what love like that can drive us to do. The mystery aspect was very well done, and I was on the edge of my seat until the very end. Do yourself a favour and DO NOT START READING THIS BEFORE BED. If you don't heed my warning, you will not be sleeping. Trust me on this. 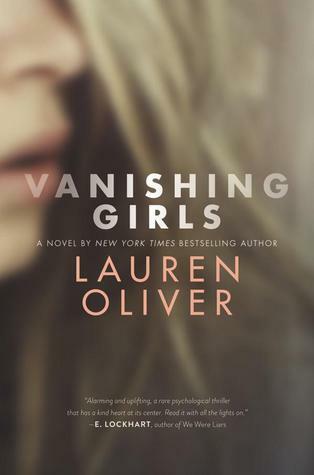 Final Thoughts: I definitely recommend this novel to fans of mystery and suspense novels, as well as those who enjoyed We Were Liars by E. Lockhart.